How can I exchange or return a product I received? We are happy to provide exchanges to ensure a better fit, or to replace items that do not live up to reasonable expectations. We do not charge to ship a replacement back to you. What is the best way to care for my Womanswork gloves? Leather gloves:The best way to clean our leather gloves is with soap and cold (or cool) water. I usually put my hands under a faucet with the gloves on, and rub the palms with a bar of soap or a liquid soap designed for natural fibers. If you want to clean the entire glove, not just the palms, you can submerge them in cool water with soap. Though they may lose some softness, they will not lose their suppleness. If they stiffen up a little, wear them to loosen them up. Your body temperature will do the trick. After washing your gloves let them air dry slowly at room temperature. Do not put them in the sun or on a radiator because the leather will dry out. 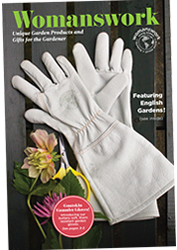 Synthetic gloves: Machine wash in cool or cold water and air dry; or machine dry on a cool setting. Where are Womanswork products made? Our line of leather gloves is made in a small factory in Arkansas, which employs about 50 people. The factory is an important economic driver in the community and it has a small environmental footprint as our product is handmade on sewing machines. Being a maker of gloves is considered a skilled job, with each glove being made of 5 separate pieces, in some cases, that are sewn together (10 pieces per pair of gloves). More than a third of employees have been with the company for more than 20 years. We also make products in China. On my visit to the factory in Nantung (near Shanghai) I confirmed that the conditions are pleasant and comfortable for the people working there. The factory manager is a woman and the atmosphere is congenial. In addition, the factory meets or exceeds all international norms for satisfactory working conditions. Yes the Womanswork website is secure. Our site is protected by SSL encryption, which encrypts all information between our customers’ browser and our web server. After our customer enters credit card information it is sent encrypted to our gateway processor. We subscribe to a special service so that no credit card information is stored on our side of the transaction. Our processor assigns each transaction with a token number, so when the transaction is authorized initially (at the time of submitting the order), it is sent back to us as a token or ID#, with no detail about credit card info. When we go to finalize/capture the funds after shipping the product out, we send our processor only a token or ID# and they are able to unlock the information once it gets to their secure server and approve the transaction. The approval code comes back to us, but again no credit card info is shared. What does the logo NWBOC mean? Womanswork is 100% woman owned. We are registered as a Woman-Owned Company with the National Women’s Business Owners Corporation, which conducts an audit to ensure its members are majority woman-owned. 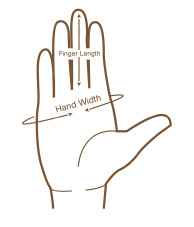 How do I measure my hand to determine the best glove size to order? See the video below and then look at the dimensions posted on each product page on the "Sizing" tab.